Almost every modern Android device today sports a fingerprint lock feature, but is it really secure? Here’s everything you need to know about it, and some special ways to get the so-called real fingerprint lock feature on phones that don’t have a fingerprint scanner. Most millennials remember movies and TV shows that glorified biometric fingerprint lock technology, with tech secured by a simple scan. Who could forget the strife of the olden days when keeping your phone secure needed more than just a tap? From setting up super-long password and pin combinations to using Android’s pattern security, fingerprint lock is a futuristic leap. Apple did popularize the trend of using biometric security on iDevices with Touch ID, but it certainly wasn’t the first. Android brought fingerprint lock to the mainstream consumers all the way back in 2012 with the Motorola Atrix 4G. 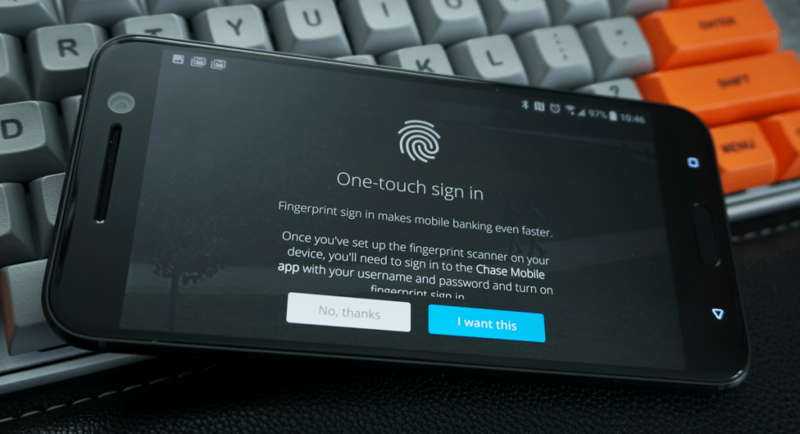 While the technology was much slower and less accurate than the lightning-fast fingerprint scanners on Android today, it was a step in the right direction. Until the advent of real fingerprint lock security on Android, the security system followed only the “what you know” method. “What you know” security system essentially means that your mobile security depends on the information you have knowledge of (password or PIN that you have created and saved). However, the fingerprint lock on your Android device brings in the “who you are” security system, which is a game-changer. This means that your mobile security is directly linked to your personal identity, just as it would be when you would set a face lock or an iris scanner lock. While the knowledge of your phone’s password, pattern or pin can easily become public, physical attributes are harder to fake. For all the forgetful ones out there, losing your password or security pin is not entirely new. But there’s no way to misplace your fingerprints or your eye, which is what makes them a whole lot secure. People who personally know you can most likely make out what your preferred password or pin could possibly be. 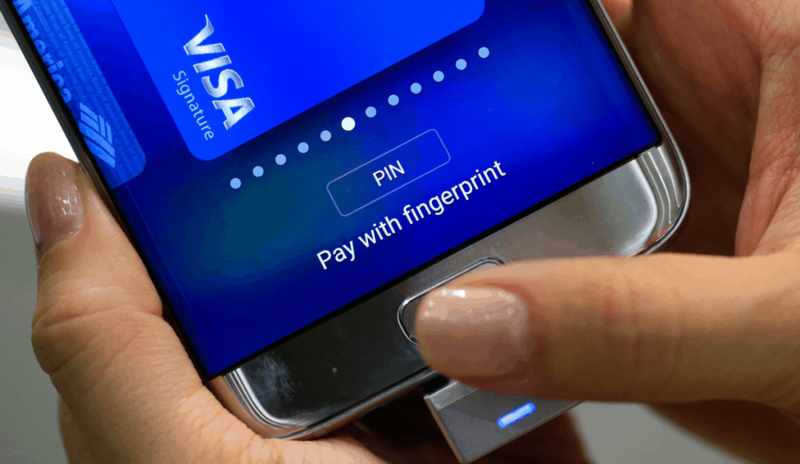 However, there’s no guesswork when it comes to fingerprint, which is why every major mobile manufacturer has adopted it. A study by the New York Times highlighted that more than half of mobile users have no security set up. This opens up the floodgates of your Android device to all sorts of malicious activities, identity theft and more. Reliable security tech such as a real fingerprint lock and its sheer simplicity is what has made it so popular. However, the security system is not infallible, to say the least, especially on personal devices such as your Android phone. In a world where billion-dollar firms aren’t safe from cyber attacks, you can’t expect the teensy fingerprint to lock everything down. Not all fingerprint sensors are built equally and the technology behind them is what determines how foolproof they are. For instance, optical sensors are useless when it comes to distinguishing the fingerprint from a picture of the finger itself. Capacitive fingerprint sensors do use 3D mapping technology and pressure sensitivity to offer precise results most of the time. However, they can easily be tricked by using a mold of somebody’s finger (and it’s easier than you would imagine). While improvements over the current fingerprint lock technology are undergoing, there’s no denying the fact it does have its limitations. The “who you are” security system that makes fingerprint lock so useful, is the same aspect that makes it vulnerable. Losing your credit card is a hassle, but you can always call up the customer service and ask them to block your card and change the pin. However, if your fingerprint is stolen, you not only give away access to your personal mobile device but everything else with it. Most Android device manufacturers ensure that your fingerprint information is stored in an encrypted form and never shared. However, third-party apps may not extend the similar courtesy and could either directly or mistakenly store your fingerprint on the local system or an unsafe server. Either way, while you can always hit reset on your password/pin security, there is no way to reset your fingerprint. What if my phone doesn’t have a fingerprint lock? 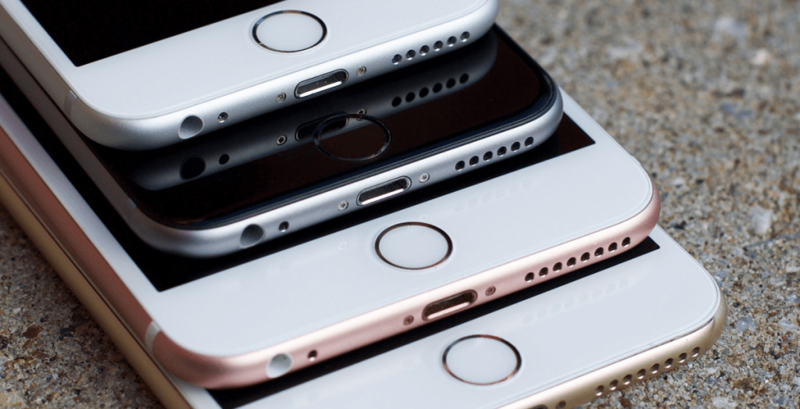 We’ve probably got you all paranoid about using the real fingerprint lock on your phone by now. There’s no denying the fact that fingerprint security on mobiles is here to stay, thanks to its ease of use. The technology is only going the get better and there’s no stopping it, but do suggest implementing it wisely. While there’s no better way to deter prying eyes from your phone with a fingerprint lock, maybe setting it up for your banking apps like PayPal is not the best idea. In general, fingerprint security does more good than harm and deters unauthorized users from even attempting to unlock your device. Although Android officially introduced fingerprint authentication, but not until the release of Android 6.0 Marshmallow. This means that all the devices running Android 5.0 Lollipop don’t support the hardware for fingerprint lock, which is quite a lot considering the present state of the Android market. So how do you get the security deterrence of a real fingerprint lock without the hardware to support it? 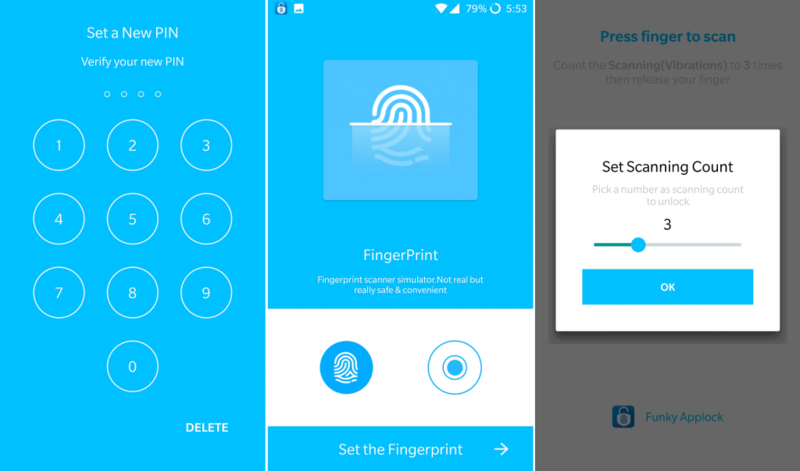 The solution to even a hardware-oriented problem as this one is one of the several real fingerprint apps for Android. Designed to give you reliable fingerprint security even on your non-supported phone, these fingerprint apps are definitely worth the effort. Even without the latest and greatest in security, your Android device has tons of smart features. These features are magnified with some of the most innovative apps available on the Google Play Store, including real fingerprint lock. While the trend of fake fingerprint lock apps has been around for years, the latest batch has some science to it. 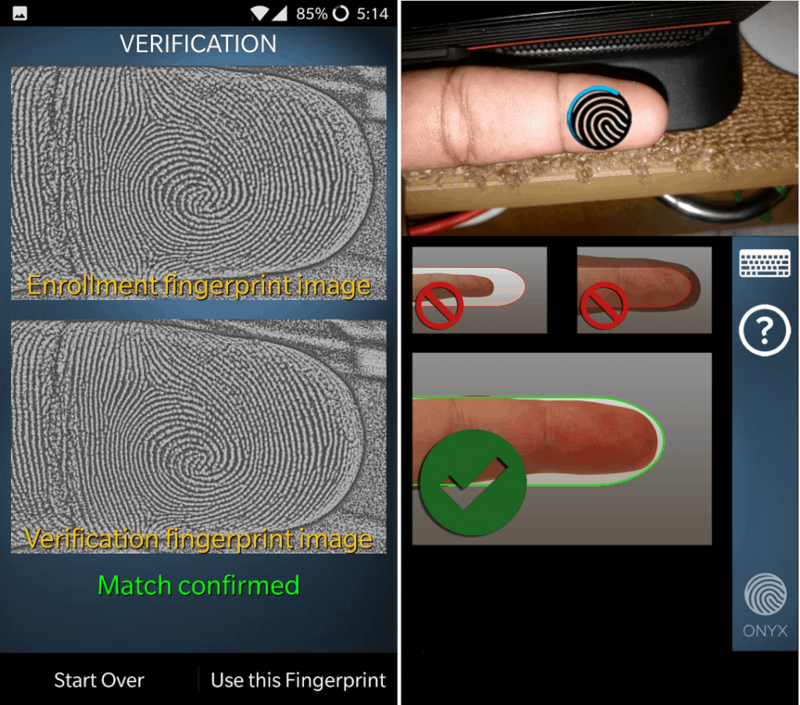 We sifted through the Google Play Store to find a bunch of real fingerprint lock apps that use actual biometrics. From spoof apps to fake the working of a fingerprint scanner to ones that use your phone’s camera as a fingerprint scanner, here are the coolest fingerprint lock apps for phones that don’t have a fingerprint sensor. Remember: It should go without saying that without the actual hardware to support it, fingerprint scanner apps are entertaining at best. While some of the camera-based finger scanning apps are surprisingly accurate, they can easily be fooled and come nowhere close to the real deal. While you should definitely give them a try and even depend on them to keep your phone safe and secure, don’t expect the accuracy and safety as you would with a real fingerprint sensor. Designed with real science behind it, ICE Unlock brings you the power of fingerprint biometric scanning without the intended hardware. What this app actually does is substitute your camera for an optical fingerprint scanner by capturing the ridges with imaging. We tested the app ourselves and surprisingly, the app works just like a fingerprint scanner would. Of course, the scanner did fail to capture the fingerprint once or twice in a dozen times, but the imaging technology behind the app is surprisingly good. 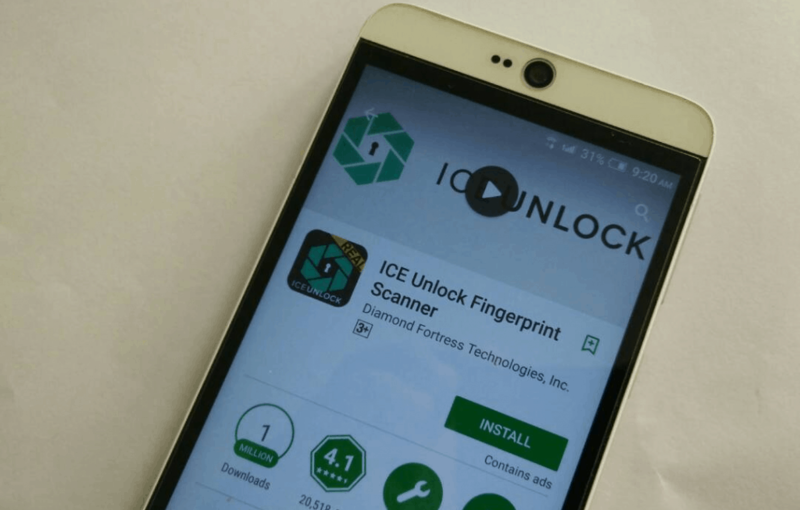 Unlike a bunch of spoof apps available on the Play Store, ICE Unlock offers real fingerprint unlock features. 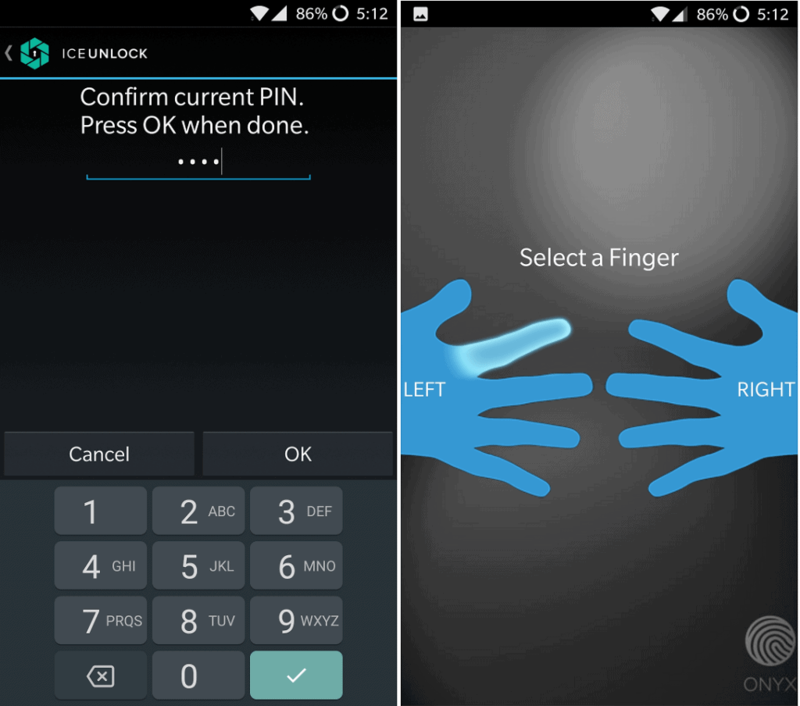 Available free of cost on the Google Play Store, you can simply look up ICE Unlock Fingerprint Scanner. We’ve also included the link to the app down below, so go ahead and use it to get ICE Unlock for free. The first time you launch the app, the only permission it will ask you for is to be set as the default launcher. ICE Unlock needs this permission to launch itself every time you swipe the lockscreen to access the app. The app will make no changes to your current launcher settings and work in the background, so make sure to press “Always” when you see the pop-up. As an added security measure, ICE Unlock will ask you to set up a numeric PIN in case the optical fingerprint scanning fails. Set and confirm your PIN to move to set up your fingerprint using the phone’s camera. The next screen will ask you to select the finger that you would like to scan and enroll with the ICE Unlock app. The camera will now launch and you’ll need to place your finger within the guiding area as shown in the image for the scanning to be completed successfully. The app will scan your finger a total of 7 times to create an optical biometric scan of your fingerprint. Once this is complete, press the “Use the Fingerprint” button at the bottom of the screen to complete the process. Now that you have the real fingerprint lock set up, all you need to do is exit the app and turn off your screen. The next time you go past the lockscreen, ICE Unlock will automatically launch, along with the camera and flash. All you need to do is place your finger right in front of the camera, just as you did when setting up your fingerprint. 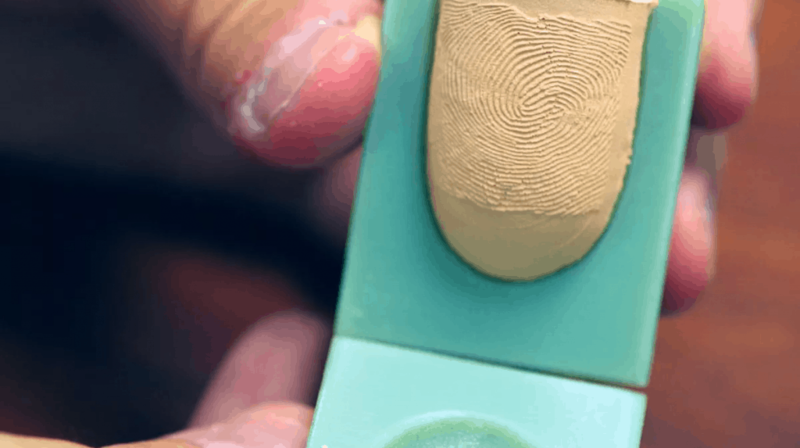 The guidelines will turn green and capture an image of your fingerprint and match it with the previously saved image. If it’s a match, the phone will unlock and you’ll be able to access the apps and other content. The process only takes a couple of seconds, so it isn’t too bad, but obviously incomparable to an actual sensor. Either way, we like the app cause it not only gets the job done and works on any Android device. What makes it even better is the fact that it offers a technology-backed solution that uses real fingerprint lock security. This is yet another type of applock out of the thousands that are already crowding the Play Store. Smart AppLock offers a solution to phone security and privacy with a fingerprint scanner, that doesn’t offer real fingerprint lock. 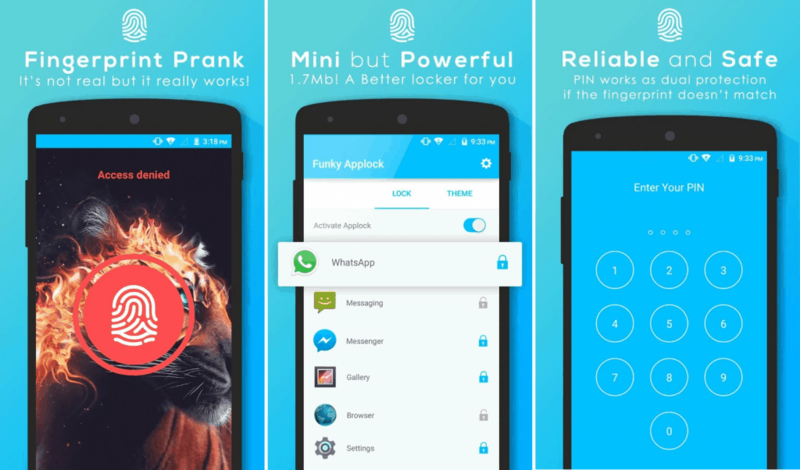 This lightweight app lock basically spoofs an on-screen fingerprint scanner based on the number of vibrations. Unlike the previous one, Smart AppLock doesn’t use biometric identification, but simple rhythmic vibrations to create a layer of security between the user and the apps on your phone. Available free of cost on the Google Play Store, you can simply look up Smart AppLock using the search feature. You can use the official link given down below to download and install the app on your phone. You’ll have to start off by setting up a 4-digit security PIN for the Smart AppLock to access and customize the settings. Once you’ve done that, the next screen will ask you to “Set the Fingerprint”, so tap on the button to continue. At this point, you will need to set the “Scanning Count”, which essentially means setting up the number of vibrations. You can set the scanning count using the slider, so set a number and press the “OK” button to continue. Make sure that you remember the scanning count that you have set up since you will need it when unlocking. 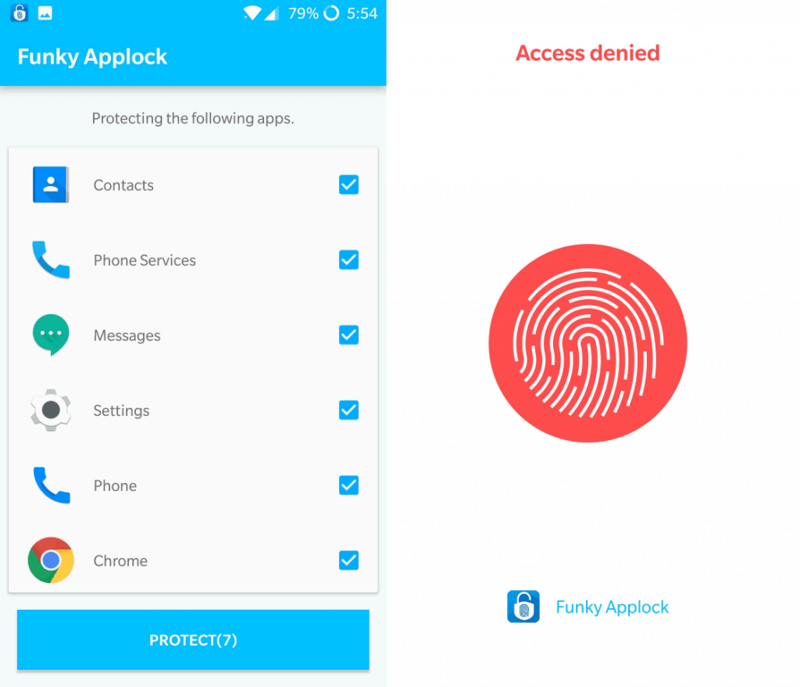 The Smart AppLock will automatically suggest a number of apps that you should protect with it. However, you can choose to deselect them or add even more apps to the list easily. With the fingerprint lock set up and ready, launch an app that you have set up with Smart AppLock. The applock will automatically launch above the app that you want to access, with the fingerprint icon on the screen. Press and hold the fingerprint icon and count the number of vibrations that you feel. Make sure that you lift your finger once the number of vibrations you had set earlier is completed. For instance, if you set the scanning count to 3, make sure that the device vibrates three times. The screen will unlock and you’ll be able to access the app, just as you would on a fingerprint-enabled device. Moreover, the SmartAppLock even comes with its very own Media Vault to help you store personal images, videos, and files. Are you relying on your phone’s fingerprint lock completely, or are you being careful enough to use it wisely? Did you find either of these cool fingerprint lock apps to be anything close to the real deal? Be sure to speak your mind and let us know what you think in the comments section down below.